Miss Print: This Past Week + the Giveaway Winner! Hello all! Well, what a week! First off I'd like to take a minute to welcome my newest sponsor Southern Fabric (you can see their button over there on the right)! Even if you're not in the market to buy any fabric right now, you should definitely check out their site - they carry some excellent fabric, the site is well planned out, and I think the design is very pretty and fun! So this week has been quite interesting - first, there was being in Stitch Craft Create (which I talked about in my last post) and then I got my sewing machine back! Hurray! Welcome home Genevieve - I missed you! Some of you may know Genevieve's story, but if not and if you're interested, you can read about it here. 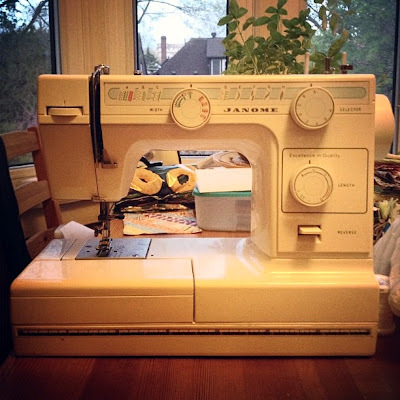 Yep, this is the little girlie that I do all my sewing and quilting on; she's not very big or fancy but she gets the job done. I would love to have a sewing machine with a bigger throat space and maybe some more bells and whistles, but I do love my Genevieve. Is it weird that I named my sewing machine? Have any of you done the same? 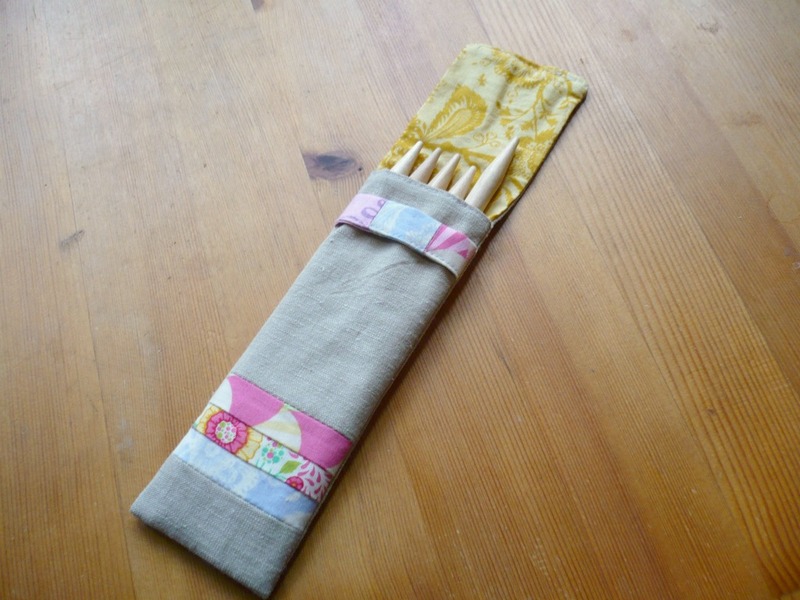 In honour of Genevieve's return and as a means of testing her out to make sure she was good to go, I made this little Patchwork Pencil Case from Rashida's book Zakka Style. This particular project was designed by Shannon Dreval of Petits Details. I changed the dimensions slightly to make it longer so that it could hold some DPNs - the original finished measurement is 6 3/4" long, but these DPNs are about 7 1/2" long so I elongated both the lining and longer linen piece by one inch. Aside from the natural linen, all of the fabrics are bits and pieces from Tula Pink's Parisville line - these little scraps are leftovers from a quilt I finished almost a year ago and still haven't show. Procrastinate much? 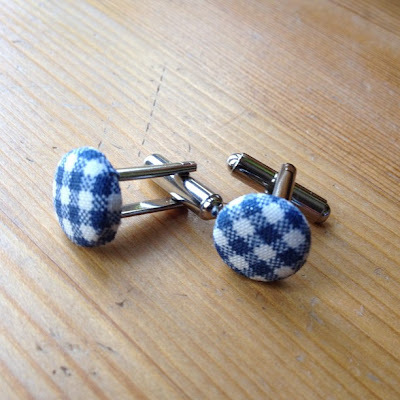 I also made Alex some cuff links using a blue gingham fabric that is one of his favourites (the same I used to make him this tie) - I believe this particular gingham is by Cranston. The tops are 1/2" wide and are the perfect size for french cuffs. I was thinking about making some of these for my shop (maybe in Liberty, more gingham, etc); what do you guys think? Congratulations Jenelle! Please send me an email with your address and FQS will get your bundle sent out. And seriously guys, you should totally go and check out Jenelle's blog - so pretty and she makes beautiful things! Also, one last thing before I gotta go, this is the last week for Fat Quarter Idol over at Sew Mama Sew! This round will end tomorrow and the theme is My Style: Fabric - go on over and enter if you haven`t had the chance yet! I love the needle case!...and the cuff links are adorable! I have two sewing machines: Helga (she's a very old Viking) and $carlett (my new Janome Horizon 7700). They NEED names. How else are you going to coo at them affectionately or snarl at them properly when they...uh...snarl? Hahahaha, you guys are awesome! I love that you name your sewing machines too. Then again, I name pretty much everything (just like CitricSugar) so I've never found it odd. Woo Hoo!! Thank you so much Kaye and FQS! I can't wait to see the fabric in person. :) Your cufflinks are so awesome too (and my husband really needs a pair). Did you buy a kit for the metal portion? Congratulations Jenelle! No, I didn't buy a kit for the cuff links - the link parts I bought from a supplier and then I created the top portions myself. Your needle case is so lovely...doesn't that Zakka Style book rock??? I'm enjoying the projects each week for the Sew Along...will have to take a breath in a couple of weeks.